The original frozen dinners were literal recipes for disaster. Take the fact that they were first introduced in the 1950’s when a nutritious dinner was defined by meatloaf and mashed potatoes with pie for desert. Add to that the fact that they catered to bachelors, whose main goals of eating were to fill their stomachs. Then, consider that the food had to be preserved, which adds a boatload of sodium to the equation. Put it all together, and you get a 1,040 calorie chicken pot pie, with 62 grams of fat, 26 grams of saturated fat, 1,480 mgs of sodium, and 14 grams of sugar. As you may have guessed, there has been an appropriate amount of backlash. 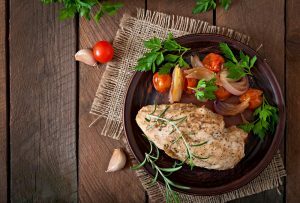 With the increased knowledge of nutrition, it comes as no surprise that sooner or later someone was likely to come up with a slightly more balanced way of preparing dinner instantly. Here are some of the kindler, more gentler versions of the original enemy of the artery. The ingredient list in this meal is so healthy, you might start feeling stronger just thinking about it. This North African option blends chicken, broccoli, butternut squash, chickpeas, brown jasmine rice and kale, topped with harissa, a spicy paste consisting of garlic, hot chili peppers, coriander, and caraway seeds, known to blast away fat. Capsaicin, the ingredient that gives the sauce its kick, is a proven appetite suppressant and metabolism booster, and the regular consumption of the caraway seed is associated with weight loss as well. You may not know how to pronounce it, but you have probably seen quinoa popping up on restaurant menus and in health food stores quite a lot recently. Why are the bowls popular? They provide an easy way to combine flavors and spices with protein, healthy grains, and produce. The South American inspired quinoa bowl mixes meat free proteins, such as black beans, and red quinoa, for a meat free answer to high protein. With all the new super foods on the market, tofu almost seems to get taken for granted. However, its still a very healthy option and can be the basis of a smart frozen dinner choice. Try an organic heat and eat, mixing tofu with a rainbow of veggies, including carrots, cabbage, broccoli, jalapeños, zucchini, and hot pepper for a low fat, high protein boost. Ravioli in the microwave! How revolutionary! These protein and vitamin A filled ravs are stuffed with ricotta and butternut squash, and topped with kale, roasted tomatoes, and a sage garlic and lemon sauce. Wait til you tell your coworkers what was on the menu at your house last night! This is an exotic combo for a frozen dinner. The entree is served on a bed of whole grain and sesame pilaf, comprised of brown rice oats rye, red wheat, barley, and sesame seeds. Top that with black beans, peppers, carrots and roasted onions, and you’ve got a bowl loaded with fiber and protein. Add some mango, ginger, and other seasonings, and you have preservatives that keeps the sodium content down for better heart health. What is your best frozen dinner recipe? Let us know how you do health in front of the TV!